This really is the room that started all the baby madness. But can you blame us? This turned out SO adorable! The bedding is all custom-made... by us, of course. 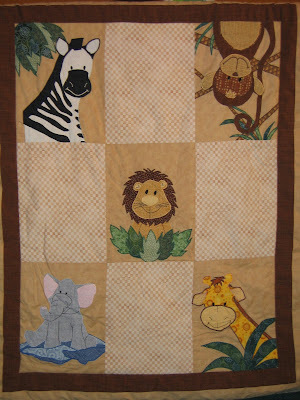 The only credit I really can take is for the original sketching of the animals on the quilt. 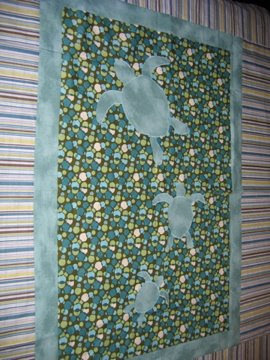 Tracy, the only one of us with an actual degree in interior design finalized the design for the quilt and everything else. 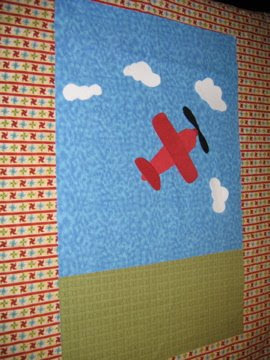 This is a quilt designed by my mom. We kind of kicked of a new era this summer as we were preparing for 2 new babies joining the family, and now it's all about babies. Can't complain, though, it's all so stinkin' cute! Okay, so this project started when one day, my dad complained that they didn't have any of my work up at their house. So, we found a picture of Venice we all liked, and decided to put it up on their dining room wall. If I had known that I'd spend the next three months stuck at the top of a ladder, I might never have begun. Just to give you an idea of the enormity of this project, the wall was 10 feet high and 13 feet wide, so it was not only the biggest, but the most detailed work I'd yet attempted. It took FOREVER just to get a piece of it done. I believe it took me 2 weeks just to get the first building done. The finishing touch of course, was to paint a portrait of my parents in the gondola. I didn't do as well on that part as I'd hoped, but I've never painted people before. I guess now I know what I need to work on. Everything considered, though, I was pleased with how it turned out, and I'd love to do it again someday. Some good friends of mine had me make over a good portion of their home a while back. The fireplace, which consisted of a large brick facade that separated the dining room from the living room had been enameled white at one point in time, and my friends thought it was a major eyesore. They were right. So, we decided to make it into a mural. 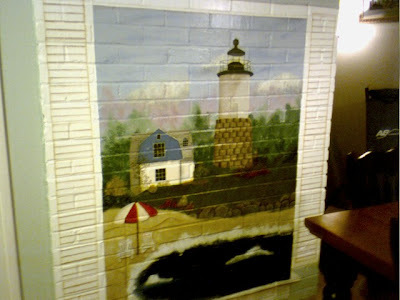 Since we'd chosen an ocean theme in the surrounding rooms, we decided on this lighthouse scene. 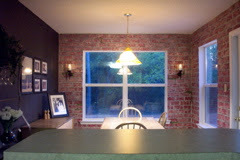 Painting on the brick was definitely a challenge, but it did at least improve the room. My friends said that now when they looked at it, it wasn't something repulsive, but a piece that they loved. Glad you like it, guys! I can't seem to stay away from the whimsy French idea. I had a blast painting this stairway. The bottom half was painted a pale lavender, and then I sponged on deeper purple stripes. 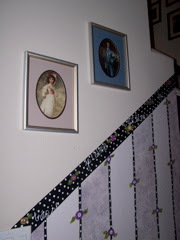 I outlined each stripe with a thin black line dotted with white and embellished with purple roses. The border was black, with little rosettes and French phrases scripted on. I added a fanciful mirror and framed some small painting replicas of Pinky and Blue Boy. Very girly, I know, but it made going up the stairs with a basket full of laundry much more cheerful. At one point in time, I was working as a painting instructor at the local craft store, so I had all kinds of time to paint lots of different things. Here's a few of my favorite pieces. This is my husband's personal favorite, as he is absolutely obsessed with Asian culture. We started by painting our walls a rich red. The ceiling was painted black and covered with a sheer gold glaze, then a Chinese scroll wallpaper border was pasted along the edges. We also installed crown moulding. Next, we cut up our headboard and rebuilt it to resemble the gateway into a Japanese Shinto shrine. We did the same thing to our dresser mirror. We lacquered all the furniture shiny black. We decorated with several items we picked up while touring Asia, some airbrush paintings from a guy on the streets of Vietnam, fans from Beijing, that sort of thing. I painted three oblong canvases with a bamboo scene on it, just so I'd have something of mine up in the room. This room was very cozy, very dark, very romantic. You'd think that red wouldn't be a calming color, but it really worked out that way. My inspiration for this kitchen came from these fabulous dishes I picked up at the Mikasa outlet. I started out by giving my walls a crackle finish - ivory over black. I wanted the foundations to look like an older building. The cabinetry I sanded down and painted a lilac color, trimmed out in black. 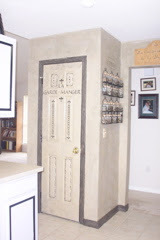 I added some swirly black handles to all the cabinets and drawers, and some whimsical swirls around some of the objects on the wall, like the clock, the spice racks, the pantry. Along the pot racks I arranged a number of old photographs, some antique pieces, and some small canvas paintings I'd sketched to resemble my dishes. 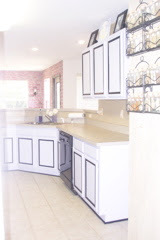 I loved putting this kitchen together. Each step was an adventure. Okay, I LOVE this dining room. It was so easy to do, too. I used a sponge I'd cut out in the shape of a brick along with a variety of red, grey, and white paint to stamp the pattern onto the walls. 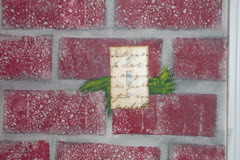 I then used a number 2 pencil to shade the bricks and add dimension. I then covered it all with a light gray wash, added some cracks and moss here and there, and voila! I also decoupaged the light switches, the table, and the doors of the buffet with a French script-covered paper, making them not only match, but one-of-a-kind. 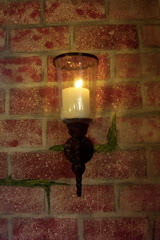 I picked up some cheap candle lamps, attached them to the walls, and voila! You have a very cozy dining room, reminiscent of an old downtown hole-in-the-wall cafe. Even better, though, we had a wonderful view of the forest about 100 feet away. You can't get that downtown! 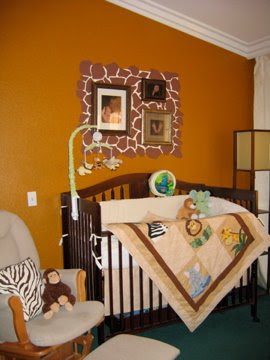 This is the first of 3 nurseries I did for my son. The reason is because we moved 3 times before he was 18 months old, and I loved how it looked when finished. I basically copied the design from the crib set that I purchased, drawing the animals on the walls. The first attempt, what you see here, had the "mural" on the top 2/3 of the walls, while the bottom third was striped vertically with giraffe spots. In the second nursery, I changed the direction of the stripes on the bottom, and found Wallies, these fabulous wallpaper cut-outs that matched my crib set. I pasted the Wallies on the bottom third of the wall, then stenciled in letters so that if I had a picture of a giraffe, it said "G is for Giraffe," etc. I also printed off some pictures of my son to personalize the room a bit, which I pasted to the walls and added "J is for Jason." Our last move was from Mississippi to Northern California, so we downsized to an apartment. Because I knew I'd have to paint over whatever I put up when we left, I decided to paint only one wall, mural-style. I'm a stay-at-home mother of 2, a lover of all things creative, and an admitted perfectionist. I enjoy spending time with my family, hanging out with my girlfriends, and most things domestic (I hate the cleaning up part).